Dogs love to tug but it's important that they do it safely understand what can cannot be tugged upon. The 'drop it' command is an excellent one for tuggers to master. Rubber grips or bite-zones provide outstanding comfort and safety for both dog and owner The rubber centre connector with control-flex technology eliminates potentially dangerous snap-back Great for encouraging exercise The KONG® Tug represents the highest level of tug toy innovation, comfort and strength. The rubber grips or bite-zones provide outstanding comfort and safety for both dog and owner. The rubber centre connector with control-flex technology eliminates potentially dangerous snap-back and provides a comfortable and controlled playtime. 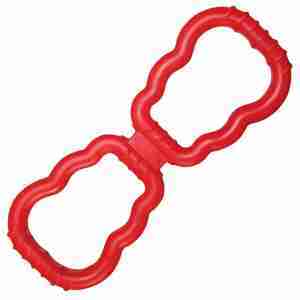 Both my dogs are big chewers and spend loads of time playing, chewing and amusing themselves with this toy. They also love tugging together. No signs of damage yet and they've had them for a few months now. Would definitely recommend. Maizy`s a terrier with the jaws of a steel trap and the tug-of-war skills of an entire rugby team. This is her dream toy. A human end, drool free, and a dog end. You can turn it upside down between bouts so the upper rather than lower teeth get to sink into the textured surface. She loves being lifted off the ground hanging on to things which subsequently usually snap. This shows no signs of wear under the 7kg terrier test. We all love it!